If you’ve been toying with the idea to visit the Netherlands, let me help push you in the right direction…..GO! The people are welcoming, the landscaping is beautiful, the food is really good and it is super kid friendly! From visiting Amsterdam to soaking up the culture in Kinderdijk with its beautiful 18th-century windmills, it’s a country that you’ll fall in love with over and over. I’ll share all the tips and tricks for our 1 week trip to the Netherlands. Everything from where we stayed, what we did and where we ate. We planned our trip to coincide with the Tulip Festival at Keukenhof, if you have a flexible schedule, I highly recommend it! When did we travel to the Netherlands? How much time did we spend in the Netherlands? We spent a total of one week in the Netherlands, taking a day to arrive and a day to leave (driving from Germany). We could have easily have spent longer in the Netherlands. We wanted to see De Haar Castle in Utrecht, visit the De Leeuw windmill in Aalsmeer to purchase flour, Zaanse Schans (even though it is pretty touristy) and the NEMO science museum in Amsterdam, but we ran out of time since we like to take a laid-back approach during our travels. How did we get to the Netherlands? We were living in southern Germany, so it was an easy 7-hour drive that we broke up into two days. Our trip coincided with my birthday, so we spent a night in a castle hotel near the border before making our way to Efteling (more on that theme park later). How did we spend our time? We choose to stay in Aalsmeer since we were traveling with another family (also with young children), so we needed plenty of space. Feel free to check out the link and see if this beautiful kid-friendly home will meet your needs. There was a grocery store just down the street and a playground across from the house. We enjoyed helping to care for the family cat and rabbits in the backyard. If you’ve never used Airbnb, use this referral code to get a discount on your stay. There was a nice playground across from the house we were staying in. Prefer to stay in Amsterdam or you like hotels better? When we aren’t staying in an airbnb, we use booking.com because they offer reward stays (and as a frequent traveler, that’s a huge bonus!). Click the link below to search their database for all their great properties. Ready to jump into all the details? Here we go! If you’ve never heard of Efteling, it is likely because it is a unique place to visit in the Netherlands. We loved Efteling so much the first time, we actually made a return visit over a year later and stayed at Efteling Bosrijk. What is Efteling? Efteling is a theme park based on elements from ancient myths and legends, fairy tales, fables, and folklore. It opened in 1952 and has morphed from a fairytale garden into a high scale theme park, while still maintaining the original charm. My father visited when he was a young child and then returned with us in 2018, which was quite the delight to see how much it has changed. Want to read more about Efteling? Check out my blog post here! Or click the photo below. A visit to Keukenhof, a tulip garden near Amsterdam, was one of the highlights of our visit to the Netherlands. It is a beautiful and expansive tulip garden with almost 80 acres of over 7 million flower bulbs (which are planted annually in the park). If you want to see tulips in the Netherlands, this is the place to go. The theme for 2019 is Flower Power; tickets are for sale from 21 March until 19 May. Tickets are on sale for 2019 if you like to plan. If you order your tickets now, you’ll pay 2018 prices. We waited until a few weeks before our trip to purchase our tickets, so there is no need to book months in advance. This is a common question in the travel groups that we frequent. Anything related to the flowering of trees, plants is weather dependent. You can look at trends and when the tulips were in peak bloom the year before, but each year is slightly different. If you want to follow the reports, check out the Keukenhof website for the details. However, we can explain the different periods of time that you can visit and what to expect. Early in the Season: In late March to early April, the park begins to open featuring their massive indoor flower show. You’ll see beautiful blooming tulips. Venture outside, and you’ll discover daffodils and crocuses. Mid-Season: After the daffodils and crocuses have lost their luster, the hyacinths and early tulips will begin to show. The outdoor gardens fill with color, and the crowds start to descend. End of the Season: This happens in late April to mid-May. The last of the tulips will bloom, and the early tulips begin to die. I’d suggest aiming for mid to late April unless the weather has been unseasonably warm or cold. Check out some of the fabulous flowers you’ll see below! How to get from Amsterdam to Keukenhof? Keukenhof is a short 30-minute drive from Amsterdam, which makes it easily accessible. If you do not have a car, you can easily ride the Keukenhof Express bus as mentioned above in the Keukenhof tickets section. 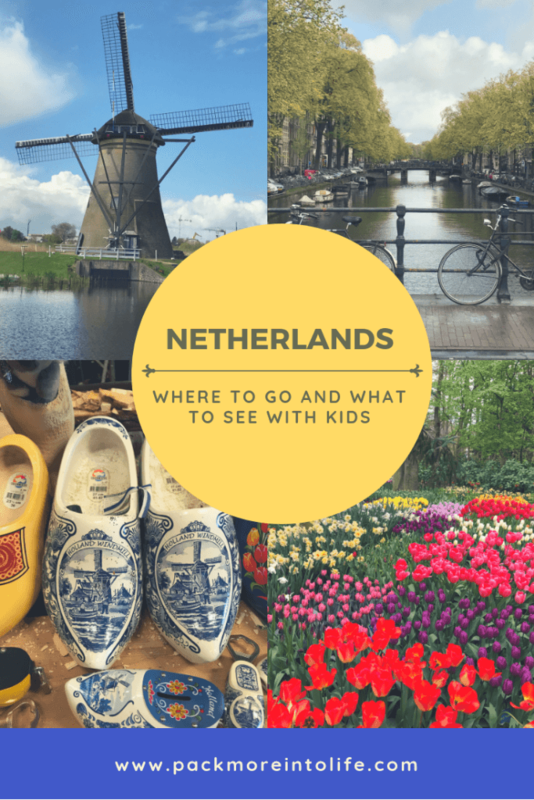 What to see and do in Keukenhof with kids? Here are the highlights of how we spent the day in Keukenhof. We arrived early in the morning to get an early start before the crowds descended. Keukenhof is open from 8am-7: 30 pm. I did my research ahead of time and discovered the boat ride through the tulip fields (Netherlands) gets busy. So head there first! The boat ride ticket office is located near the Mill. We purchased our tickets and then grabbed a coffee and climbed up to the top of the Mill to enjoy the views over the gardens. We had about 30 minutes before a tour was open to ride the boat. Boat ride in Keukenhof: It was an ok ride. The field wasn’t as vibrant as I was hoping and we were seeing the field from below in the boat. It was rainy, which is never fun, but on a beautiful day, I can imagine it would be really fun. We did learn all about Holland tulips and how the tulip fields are grown. As a reward for good behavior with the kids, we headed over to explore the petting zoo, kids maze, and playground. We grabbed food at a few different food trucks near the kid’s area. By this time, it was nap time for the kids. We are thankful to have children that can nap on the go. We tossed the kids in their strollers and baby carriers and off to dreamland they went. This gave us plenty of time to enjoy a leisurely stroll of the gardens. I couldn’t get enough of the beauty: the vibrant colors, the array of designs, the multitude of variations of tulip bulbs. I could have spent days upon days just admiring them all. My mom has a green thumb, and that love of nature was passed down to me. -If you want to do the boat ride, get your tickets early because the lines can get long and the boat tours do sell out. -If you have kids, make sure to save some time for them to explore the children’s area, complete with petting zoo, maze, and playground. -Bring cash for the various food trucks; we enjoyed the food offered in the gardens. There is no filter or extra processing on this photo; this is how vibrant the colors are! One of the other fun events that coincide with the Keukenhof Tulip Gardens is the flower parade. It will take place from 13th of April in 2019. If you love flowers and you love parades, this is an event not to miss! We weren’t able to see the parade because it was early in the season, but friends of ours who did see the parade had wonderful things to say about it. Cars and floats are decorated with thousands of flowers and proceed from Noordwijk around 9:30 am and end in Haarlem around 9:30 pm. Pin the image below to save it for feature reference! We started off at Albert Cuypmarkt. It is a large daily market in Amsterdam with all kinds of vendors, including many that sell Dutch food, such as the famous Dutch pancakes. Then we thought the best way to see Amsterdam was to do a canal cruise. Since we were traveling with another couple and a total of 3 young children, we decided to splurge a bit on a private lunch tour. It was incredible! The photos don’t do the tour enough justice. Arnout was an amazing tour guide, was incredibly sweet to our children and helped bring Amsterdam to life. Our children delighted in “steering” the boat and looking out the back windows or curling up in the pillows. As the adults, we shared bottles of wine, a spread of amazing locally sourced foods and soaked up the stories from Arnout. Comment below this post if you’d like his contact details. Our tour ended too quickly, but the kids were ready to stretch their legs. Arnout gave us a wonderful playground recommendation (which is hard to come by because they are so well hidden). The boys took the kids while my girlfriend and I snuck away to catch our 2 pm tour at the Anne Frank house. I DO NOT recommend bringing small children on this tour. The rooms are small and enclosed, everything is done via the audio guide, and the stairwells are narrow. We didn’t see any young kids on tour and, I am thankful we didn’t have ours. Anne Frank Tickets: Be sure to book these as soon as possible because they frequently sell out. After our tour, we hooked back up with the kids and enjoyed wandering the streets of Amsterdam. We had planned to head over to Vondelpark and eat at Kinderkookcafé, but rain ruined our plans, so our friends headed over to explore the Heineken Experience and we headed over to the Clara Maria cheese farm (more on that below). When we started researching our trip to the Netherlands, we knew that we wanted to explore some of the cheese farms. During our one week stay, we were able to visit both boerderij geertje and Clara Maria cheese farms. Clara Maria: You’ll see this cheese farm mentioned quite a bit because it is located close to Amsterdam and can accommodate large groups. We saw plenty of tour buses rolling through. Thankfully the gentleman who saw us arrive told us to delay just a bit to allow the tour group to have their tour and then allowed us a private tour on our own, which was really kind of him! So while we waited, we went into the barn to visit the sweet cows and see the tractors. This was a highlight for our little guy! After visiting the cows for a bit, the gentleman walked into the barn to find us and welcome us inside. We started by learning about how they make the traditional Holland clogs. He told us a bit of history and about the traditions before we engaged in making our own clog. He gave our little one some goggles and invited me to use the machinery to turn a piece of wood into a nicely shaped clog. It was a neat experience to see how they are made and get to be so hands-on in making one. We were all so surprised when he flew so hard into the clog that the moisture dripped out of the wood. Impressive! We ended the demonstration with him using a wood burner to write our name and gave it to us as a memento of our experience. The next part of the tour includes how they make the cheese, but with a toddler, he knew the tasting portion would be more fun, so we quickly skipped over the information portion. Inside the shop, you can taste many of the cheeses that they have on display. We never felt rushed and were offered taste after taste! In the end, we purchased some of the smaller slices that they had off to the side in a bowl. We are huge cheese fans, but an entire roll of cheese felt like a bit more than we could handle. I think Clara Maria is a wonderful cheese farm where you can learn about the cheese making process, educate yourself about some of the traditions in Holland and get to sample some delicious treats. Boerderij ‘t Geertje: This farm was recommended to us by another family travel blogger who was living in the Netherlands at the time. It was a wonderful recommendation because it offered so many activities for the kids and had a sense of local fun instead of tourist flair. Pony rides: for a few euro you can buy a ticket to ride a pony. There were two ponies that day that we visited and a few children in line. The staff helps the children mount, and then they walk them along a path around the farm. We liked that the staff interacted with our son by asking his name and telling him information about the horse. Boat rides: go inside the shop to pay for a boat ride. The boats are located at the top of the farm, and you can enjoy rowing yourself up and down the river. We packed four adults and three kids into the boat and had a blast! Feeding baby goats: ok, this was a favorite for me. Pay for bottles of milk and feed the baby animals. Doesn’t get much better than that! See how adorable they are? Playground: lots of playgrounds to expend some energy, including one where the goats get to play right along with you. Have you ever played at a playground with goats? Well, now you can. Animals: it’s a farm, so there are tons of magnificent animals to visit and touch. Goats, chickens, cows, ducks, sheep and more. The animal lover in your family? They will be in heaven. Restaurant and cheese shop: Need something to eat or drink? They’ve got you covered. Or perhaps you want to sample more cheese; you’ll be all set. There is ample parking, and even though it was busy on the day we visited, there was plenty to do and see without feeling crowded. My mother loves flowers and that was passed down to me. I remember living in Hawaii and there was a discount bulk flower shop. I’d go inside with $20 in my pocket and end up with at least 6 huge bouquets of flowers. If you want to know where the majority of the flowers from the world are sold, head to the Aalsmeer Flower market. Follow the signs to the visitor parking and then make your way to the entrance. You’ll have to pay admission and then you’ll head up the stairs to a long catwalk. From the catwalk, you’ll see a fantastic array of beautiful flowers and plants with an orchestration of workers driving around in small carts filling orders from the digital auction. They say approximately 20 million flowers are traded here each DAY. It’s impressive to watch the logistics of supplying each order and getting it shipped within a few hours. Notice the paths that guide each cart from mass chaos and traffic jams. Staff members have headsets and digital scanners to keep everything running smoothly. One of my favorite parts was watching the staff moving about in a hive of activity. Towards the end of the walkway, you can watch the live auctions where the flowers and bulbs are sold. Everything happens digitally and within seconds. Flowers are offered for sale, and the price starts high and continues to drop until sold. From there, the staff receives the order and begins to process it. By the afternoon, the flowers are on their way into the buyer’s hands. If this part of the tour is something you are interested in, be sure to arrive early as most auctions take place during weekdays from 8 am – 11 am. We spent about 45 minutes to one hour here at the Aalsmeer Flower market. Our son enjoyed running around the catwalk, and it was fun for us to see everything in action. Want to see what it is like? Check out the video below. Another icon image of the Netherlands and Holland is the beautiful windmills. When I started planning our trip to the Netherlands, I saw two obvious choices: Kinderdijk and Zaanse Schans. In the end, we chose Kinderdijk because Zaanse Schans seemed more like a touristy area and Kinderdijk felt closer to an open-air museum. What is Kinderdijk? Kinderdijk is a small village with the world’s largest concentration of windmills! Kinderdijk has nineteen 18th century windmills located along dikes that were used by local villagers. The windmills and the land surrounding them are on the UNESCO list of World Heritage Sites. Kinderdijk Bike Rental: Originally we wanted to rent bikes and pack a picnic to enjoy the windmills. We emailed Tourist Info Alblasserdamand made a reservation for four adult bikes with three child seats and picnic lunches. We arrived at the scheduled time, but no one was at the bike rental location. We called the number, and a staff member arrived 30 minutes later. He looked frazzled as he tried to put together the bikes for our reservation. More people began to show up (without a reservation), and the one staff member started to help them with bikes instead of finishing getting us ready. As time went on, the children got restless, and the clouds began to roll in, we decided to cut our loses. We paid for the sandwiches we had ordered and set off on our own, disappointed. Parking was easy to find in the town of Kinderdijk along Molenstraat, or you can pay to park in the parking lot located just north of the entrance. We picked up some snacks and packed our sandwiches before walking on foot to enter the UNESCO World Heritage site. Kinderdijk Tickets: You can enter the area for free, but if you want to enter any of the windmills to see their inner workings, you’ll need to pay. We elected to buy the combination ticket to enter multiple windmills. You can also pay to ride a boat that takes you up and down the waterways and is a great way to see the windmills without having to walk. What to see and do? We took a relaxed walk to the windmills, enjoyed a nice picnic lunch and took turns with the other family we were traveling with to tour inside some of the windmills. We enjoyed seeing how the families lived inside the windmills with little bunks tucked into nooks and crannies. The stairs are steep and a bit treacherous, so mind your step. It was amazing seeing the engineering feat of the design of each windmill. The Dutch people mastered the ability to move water from one place to another. Further down the path, we found a windmill with an attached farm. The children enjoyed visiting with the animals, peaking into the various working buildings and watching the staff work on updating the property using tools and materials from the 18th century. You can continue down the waters edge to explore all nineteen windmills, but the kids were ready to move on, so after a few hours, we headed back to the car. We could have covered quite a bit more ground with the bicycles, but we were happy the rain held out so we could enjoy our visit. I hear the windmills are all nicely lit in the evenings, so if you are staying nearby, take advantage of the beautiful views with the light of the windmills. Another great tip from another family-friendly travel blogger! We just so happened to be in town for King’s Day or Koningsdag. It is celebrated on 27 April for the birth of King Willem-Alexander. Koningsdag is celebrated with nationwide vrijmarkt (“free market”), where the Dutch people sell their items in their towns like a flea market. There are also fun parties and celebrations in the major towns with everyone wearing orange, the national color. In honor of King’s Day, we tossed on our pre-packed orange shirts and headed into the town of Delft early in the morning to grab a coffee and snack at Kek near the market square. Once re-fueled, we wandered the beautiful flower-lined canals to browse through the many items for sale. We found old Delft pottery, children’s clothing and toys, plenty of antiques and unique items to delight any bargain hunter. As the morning wore on, we headed over to the town’s square to check out the local festivities. We were greeting with bands playing, tents with food for sale and a lively group of people enjoying themselves. We found a place to eat lunch off the market square and did some fun people watching. From there, we drove over to Delftse Pauw Factory (about an 11-minute drive) to visit and tour the Delft pottery factory. A nice gentleman gave us a tour and showed us how the pottery molds are made, how the pottery is fired and how each piece is hand painted by their local artists. At the end of the tour, you can browse through their selection of items for sale. Toddlers and an expensive pottery shop, we didn’t last too long inside. Even though we decided to visit in April, we didn’t want to skip on a visit out to the coast. The Netherlands is a beautiful coastal country with miles of amazing white sand beaches. We chose Scheveningen due to it’s lively, but a charming coastal town. There were plenty of things to see and do to occupy a nice late afternoon and early evening. We quickly found parking in a parking garage and then walked down to the beach to let the kids enjoy some time digging in the sand. We learned long ago to always pack a set of sand toys, not only for the beach but for the many European playgrounds with sand pits. After the kids had enjoyed their fill of digging, we headed over to the boardwalk to grab a bite to eat and then pick up tickets to ride on the 50 meters high Ferris wheel. The Netherlands was a beautiful country. We ended up returning for another long weekend when my parents flew into town for a cruise. I’ll share more about that trip soon. The people are warm, and English is spoken widely throughout the country. There are so many enjoyable activities, and we felt like it was the perfect destination with kids for the wide open spaces and bike paths. If you enjoyed this post and want to read more, head over to our destinations page to see where else we’ve explored! Great post!We loved the Netherlands! It’s such a beautiful country and love their way of life! We loved Scheveningen Beach and all the fun play areas all over the boardwalk. Thanks so much for the comment! Glad you enjoyed the post. The Netherlands is one of the countries that I could live in for a long time! I love your posts!!! Can you please give me more info on the boat tour?! Thanks! !